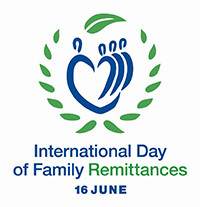 The International Day of Family Remittances (IDFR), celebrated every year on 16 June, is aimed at recognizing the significant financial contribution migrant workers make to the well-being of their families back home and to the sustainable development of their countries of origin. It is also aimed at encouraging the public and private sectors, as well as the civil society, to do more together and collaborate to maximize the impact of these funds in the developing world. 2018 International Day of Family Remittances Theme is "Remittances: One family at a time"